American poster. It opened later in the UK and “Forever After” is a cleverer title too. Indeed it is. The adults in the party thought it the best of the entire Shrek series after the slight dip of Shrek the Third, which is high praise indeed, and throughout we chortled, admired the voice-over acting, laughed at all those little visual jokes (the carriage version of a trailer park was superb), and thoroughly enjoyed the hallmark apposite choice of songs. The Carpenters “Sitting On Top of The World” has never sounded quite so perfect as when Shrek gets his ability to strike fear into the villagers back. We loved Shrek’s midlife crisis, showing him getting all grumpy and bad-tempered during his kids’ birthday party. We’ve all been there. Puss in Boots has become obese and languid. Yep, been there too. 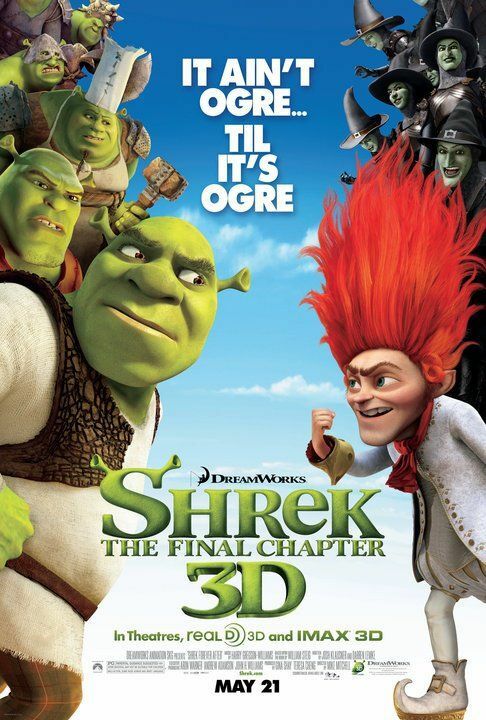 The plot is that Rumpelstiltskin deceives Shrek into letting him have one day of his past life … just any day. Shrek signs the diabolical contract. These wax seal illuminated diabolical documents also feature heavily in Disney’s The Princess and The Frog this year, which may be the swelling of a justified folklore feeling about lawyers. So Rumpelstiltskin takes the day that Shrek was born, thus Shrek never existed and finds himself in the alternative reality where he never existed. Rumpelstiltskin managed to get the kingdom via a futher diabolical contract from John Cleese and Julie Andrews (King and Queen), a deed we had seen being foiled at the start of the film by Shrek releasing Princess Fiona from the spell (in Shrek One). But now Shrek never existed so the foiling of the signing never took place. 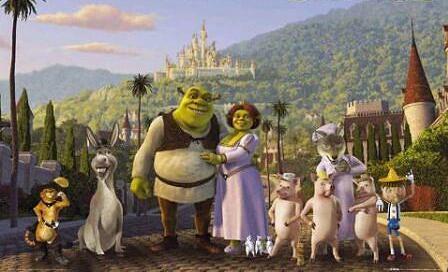 Shrek only has till sunrise in this alternative reality, then he will disappear. Phew! Rumpelstilstkin explains to a bemused Shrek that it is all a metaphysical paradox. In this new world, Princess Fiona is the leader of the ogre resistance to their dictator Rumpelstiltskin, and a mighty female warrior. Everything can be resolved by a kiss of genuine love, but Fiona doesn’t know Shrek and doesn’t love him (yet). Right. Which is where the adults seperated off from the five and six year olds in our company. We’ve all seen Dr. Who, and Back to The Future and countless other time travel stories and we know the rules of time travel; we know all about one deed in the past changing the entire future and creating a different reality. It’s folklore now. It also owed quite a bit of the Rumpelstiltskin-world landscape to Lord of The Rings. The kiddies really didn’t follow it. The joy of the Shrek series is that it’s always been akin to English Christmas pantomime. There are two levels, one directed at kids, and one directed at adults. Half the jokes are designed to whizz right over their little heads, targetting adult ears. It’s the pantomime dame saying Oooh! My butcher’s a lovely man. He never puts his meat up or Have you got any balls, Aladdin? at which the female dressed as Aladdin produces a couple of tennis balls and throws them to the audience while the adults chuckle to themselves at the double entendre. A double entendre is explained thus: A woman asked the comedian for a double entendre. So he gave her one. Yes, and that works well and enlarges the audience, except that in traditional pantomime, all the kiddies know the story anyway and can follow what’s happening. The metaphysical paradox is a step too far for the under-tens, auguring badly for future sales of Rumpelstiltskin stuffed toys. From the older point of view, I’d have gone to see it with or without children, may well take them again and will buy the DVD the day it comes out. But the six-year old opinion was squarely Quite funny, but not as good as the other three.